In May this year (2015) President Obama welcomed broadcaster Sir David Attenbrough to the White House for a televised discussion. In the interview, broadcast in the UK and US , Sir David asks the President why he cannot show a commitment to tackling climate change in the way previous presidents strived to put men on the moon. “I believe [if] we find ways of generating and storing power from renewable resources we will make the problem with oil and coal disappear,” Attenborough told Mr Obama. Sir David Attenboirough made State of the Planet at the start of the Millennium. It was screened in 2000. He repeated the message about our need to improve our custody of the natural world about us, with greater urgency in the last part of Frozen Planet in 2011. This extract is edited from my book, David Attenborough – Talking to a Great Broadcaster, available for download on all platforms – here. 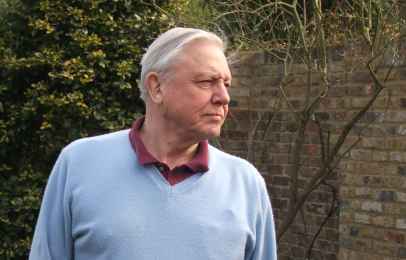 WHEN Sir David Attenborough first reported on the wonders of wildlife in the 1950s and 60s, with his inimitable, joyous enthusiasm, the world was a simple place, as black and white as his films. We faced great dangers, but they came from the politics of a turbulent post-war era. Nuclear conflict was the major threat to our planet, and we turned to nature programmes, to the innocent, untroubled world of wild creatures, as a balm. We now know a time bomb was already ticking in Paradise. But even Sir David couldn’t hear it, above the sound of the surf breaking around exquisite tropical islands and the glorious dawn chorus of the rain forest, as he filmed nature in its utmost variety and abundance for his great Life trilogy. “We had no idea what we were doing to the climate – none. Yes, there were problems, but we thought it was individual species we had to save, like the rhino and the Hawaiian goose. And, in a rather naive way, we believed the way to do it was keep them in zoos.” The Cold War ended, the threat of nuclear annihilation receded, and realisation finally dawned in the early 1990s that something was seriously amiss with our world. In State of the Planet, screened in 2001, the man whose indelible zest has done more than any broadcaster to covert us to the world’s natural marvels, delivered the (then) definitive warning that we stood to lose them. The series presented the most powerful evidence yet, gathered from the world’s top experts, that the planet was heading for a sterile, uncomfortable future if we humans don’t change our ways and tread more lightly on our world. I 1999 I met Sir David on Easter Island. He was there to film Lost Gods (shown in the spring), and also to shoot the most telling sequence in State of the Planet. We know this solitary volcanic Pacific island for the eerie mystery of its statues. But it is also one of the planet’s most complete symbols of environmental catastrophe – scoured, exhausted landscape, every last native tree felled, every bird and animal extinct. It looks more like Pembrokeshire in November than the Pacific. The analogy is inescapable: Easter Island as Planet Earth in microcosm, lost on the endless Pacific with no hope of escape for its people, just as we are adrift in space, condemning our successors to an impoverished future. Could this be the outcome for us – not a nuclear desert, but an ecological wasteland? Man will survive, through his technological might, but in a barren world bereft of the dizzying variety of nature? I asked Sir David if there was a single event, some warning signal like that shudder in Jack Lemmon’s coffee in the nuclear power station melt-down in the movie China Syndrome, which finally convinced him something was seriously wrong with the world? “Interestingly, there was not. My job is to go and photograph wildlife; so I have gone to where wildlife is, and not where it isn’t, or from where it has recently disappeared. Previous PostWhy the cuckoo failed to show, and how the BTO might find it	Next PostAre men ready for upmarket hair care?